When you hear the iconic dun-dun opening of Netflix, you’re usually prepared to sit back, relax and watch a television show or movie with no contribution. However, with the advancement of technology and the public’s increasing demand for something new and fresh, who but Netflix would devise an new way to consume entertainment? Instead of the traditional way of watching films, Netflix took one of their most popular shows, Black Mirror– known for its incredible storytelling and foreshadowing of the dangers of technological advancement in society–in for a brand new direction. The psychological thriller Black Mirror: Bandersnatch centers around the idea of choice. The viewer is given a role in determining the narrative of Stefan (played by Dunkirk’s Fionn Whitehead) as he designs a meta, choose-your-own-adventure video game called Bandersnatch in 1984 (I allotted myself five hours to explore this project). 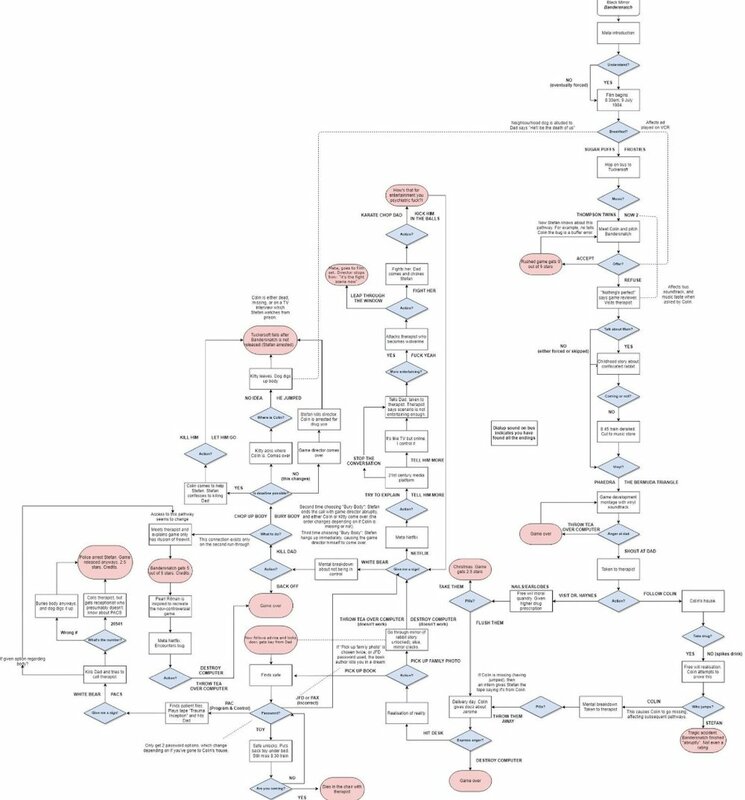 Although Bandersnatch fits squarely into a dystopian world seeped with horror, science fiction and ‘80s nostalgia that Black Mirror is known and beloved for (including references to past episodes such as “White Bear” and “Metalhead”), this movie stands alone from the television series. The film took over 18 months of planning and production, beginning with Netflix working with show-runners from animated children’s’ programs, such as Puss and Boots, to create a form of media with branching narratives. Once the children’s’ programs went through, adult programming was fully fleshed out in this new medium of explorational and interactive entertainment. When Netflix approached Black Mirror creators Charlie Booker and Annabel Jones, there was initial pushback. Concerns over “gimmicky” prior examples of interactive storytelling soon dissipated after ideas for future episodes that only worked with an interactive narrative came to the fore. The viewer has 10 seconds to make decisions for Stefan, ranging from choosing what type of cereal he eats for breakfast to whether or not he should murder his father (I won’t give too much away). Once a play-through ends, the viewer is given the option of going back and making a different choice. The average viewing is 90 minutes, though the quickest path ends after 40 minutes. According to IGN, there are five "main" endings, with variants within each ending; such endings may be intercut with credits, similar to other Black Mirror episodes. The interactive material is innovative in exploring the fact that not only does Stefan lack agency over his actions (and at times is aware of this), but the viewer also finds themselves constrained by the writers’ options. Twitter user @Storni_Ale is one of many fans who have mapped out the endless possibilities with the choose-your-own-adventure film. Some of the diagrams show that when you draw the branch off of an option, you get the same symbol referred to first in Black Mirror’s “White Bear” episode, which is also referenced in this episode; a slight nod to the viewer who lacks almost as much freedom as Stefan. The narrative branching storytelling method Bandersnatch utilizes has caused a massive social media frenzy. #Bandersnatch started trending on Twitter, with thousands of tweets, posts and memes created from the new storytelling phenomenon. Many fans loved the film, while come critiquing the gimmicky nature of the choose your own adventure component. Black Mirror: Bandersnatch is now streaming on Netflix.